The search for identity is an unending one. As we peer across big lenses of time, such as those that separate us from the ancient Mediterranean world, one of the questions that occurs again and again is “who were these people?” In the case of Palmyra, a prosperous caravan city located in the Syrian Desert, a remarkable assemblage of funerary portraiture grants us a glimpse at the self-styled identity of a number of the city’s former occupants. 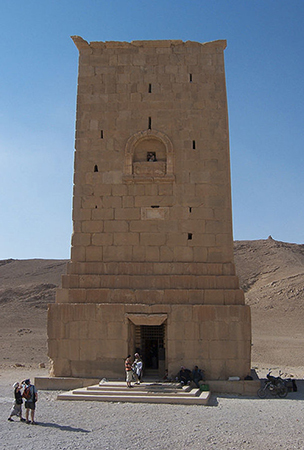 Among the tomb types from Roman Syria are the curious “tower tombs” of Palmyra, which find no comparison in Roman architecture from the western empire (above and left). They were the main tomb typology from the final quarter of the first century until the middle of the second century C.E., at which point the underground hypogeum became the preferred tomb type. A hypogeum is a subterranean tomb, most often excavated directly from the bedrock, thus creating an underground chamber or chambers for burials. 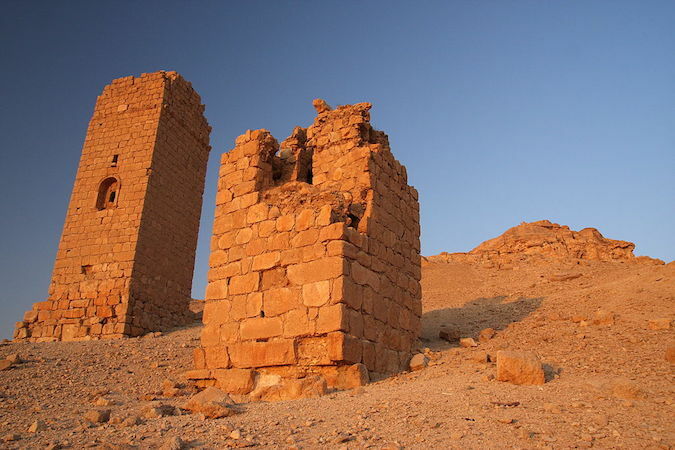 The tower tombs tend to occupy high ground and were likely built for kinship groupings. These tall, slender structures enclose tiers of niches or loculi in which human remains would be deposited. Each loculus would then be sealed with a stone slab, often carved with a relief portrait of the descendent. 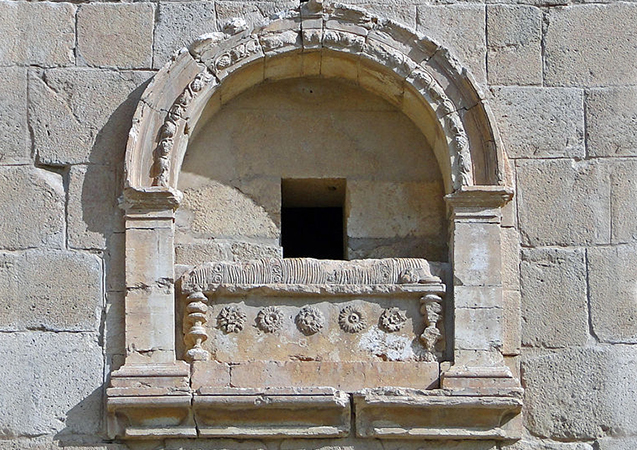 An exceptionally fine (and early) example is the Tower Tomb of Iamblichus (dated to 83 C.E. on the basis of epigraphic evidence—evidence from inscriptions). 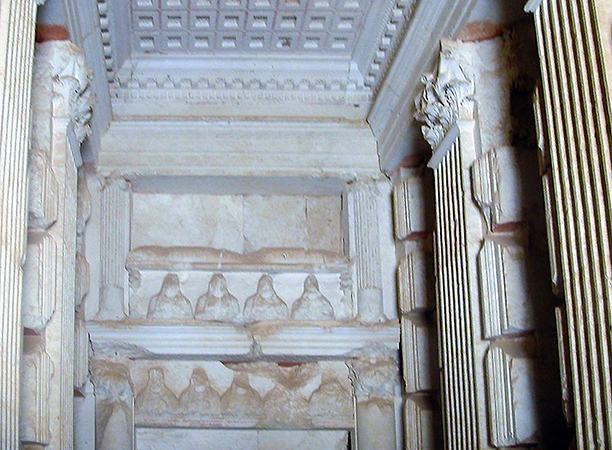 Another is the well preserved Tomb of Elahbel (above) with its elaborately coffered ceilings (below). The tomb also includes a small balcony (below). The individual loculus relief sculptures present a rich range of iconographic information about the people of Palmyra. These individualized reliefs are formatted as portrait reliefs and depict their subjects intimately, often with symbols of their status and social position. The bust portrait of a couple (above) shows a pair of decedents. This portrait carries a Greek inscription, which differs from the typical Aramaic inscriptions. 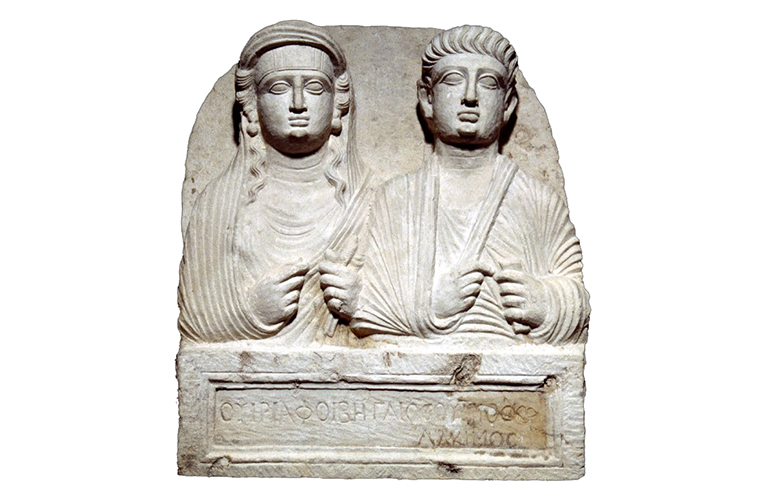 The text identifies the two individuals as Viria Phoebe and Gaius Virius Alcimus. This pair have the same clan name, a possible indication they are the former slaves of a brother and sister. Alcimus holds a book-roll, while the woman holds the spindle and distaff (both implements associated with cloth production). These objects may be meant to evoke their respective roles. A third century C.E. funerary relief from Palmyra now in the British Museum (below) depicts a funeral banquet. 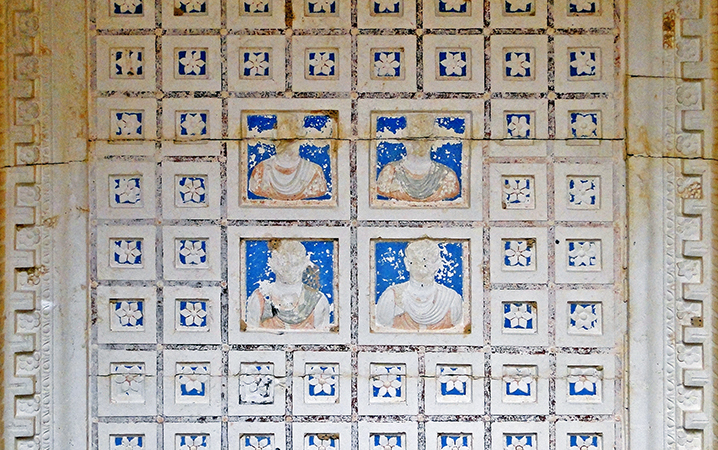 Elite tombs of this period demonstrate a mixture of Roman and Near Eastern motifs. In this particular relief that depicts a funeral banquet, the reclining male is attended by a seated female; perhaps the pair are meant to be husband and wife. The idea of the funeral banquet is a Roman motif adopted by local craftsmen. The male—presumably the deceased—reclines on a couch while holding an open vessel. He is depicted at a slightly larger scale than the attendant female. His costume is of Parthian origin, a sort of pant-suit. The Parthian empire, c. 247 B.C.E.-224 C.E. was a major political power of ancient Iran located on the eastern margin of the Roman empire. Reliefs such as this one would be arranged in groups of three in communal tombs, thereby giving the tomb chamber the resemblance of a Roman-style dining room (triclinium) in which a real banquet would have taken place. 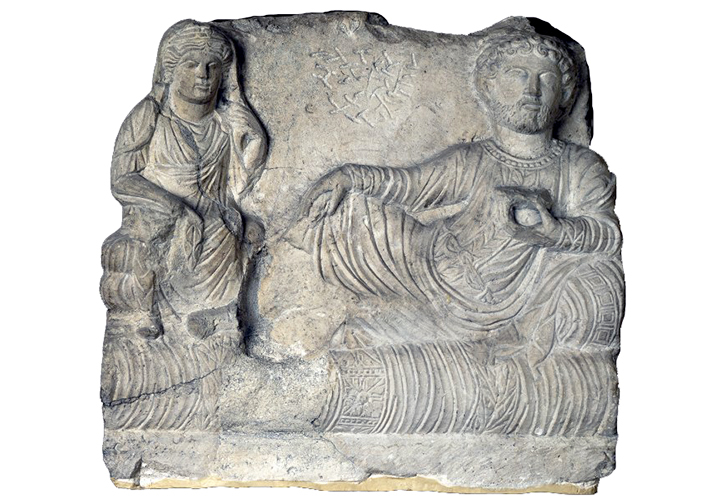 The funerary reliefs from Palmyra form a profoundly evocative body of evidence. The individualized treatment of the sculptures themselves still serves to convey important elements about the identities of these individuals. We can glean information about wealth, social status, role in the community, familial relationships—all of which help to enrich our reconstruction of ancient Palmyrene society. 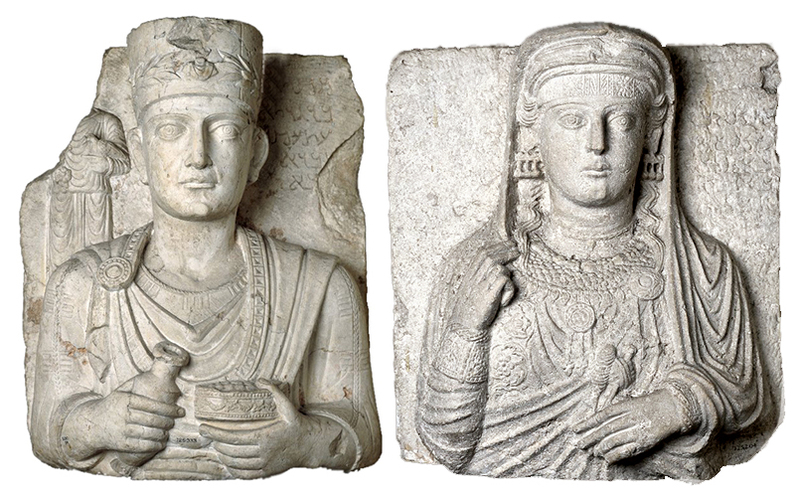 The reliefs also demonstrate the degree to which Palmyra existed in a multicultural and multilingual landscape, one in which the traits, trends, styles, and languages of the Graeco-Roman world and the Near Eastern world not only overlapped but intertwined, producing new, unique cultural objects. This is an important realization, one that helps remind us of the degree to which the ancient world was diverse and varied and that a great deal of the material culture of the ancient world resulted from shared cultural influence and hybridization. 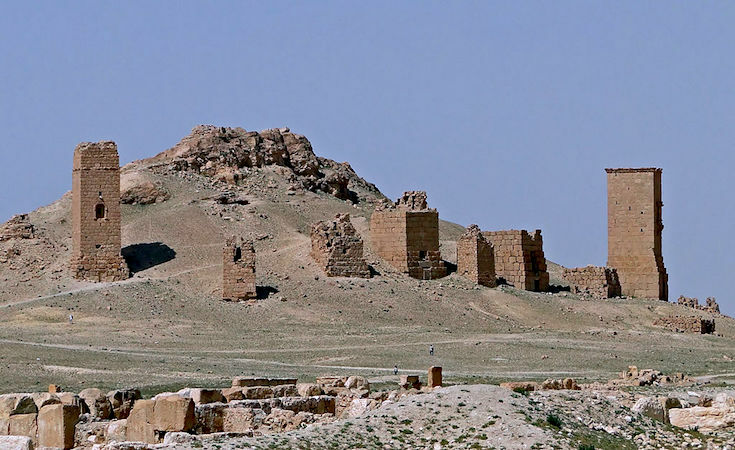 The tombs of Palmyra embody and evoke this climate of cultural diversity as they still stand as monuments to Palmyrene identity. W. Ball, Rome in the East: the Transformation of an Empire (London: Routledge, 2001). M.A.R. Colledge, The Art of Palmyra (London: Westview Press, 1976). Michael Danti, “Palmyrene Funerary Sculptures at Penn,” Expedition 43.3 (November 2001). Andreas J. Kropp, Images and Monuments of Near Eastern Dynasts, 100 BC – AD 100 (Oxford: Oxford University Press, 2013). Cite this page as: Steven Zucker and Dr. Jeffrey A. Becker, "Palmyrene Funerary Portraiture," in Smarthistory, August 8, 2015, accessed April 19, 2019, https://smarthistory.org/palmyrene-funerary-portraiture/.